Coach Smith didn't give us an update. He's the official injury person. Perhaps he will at 2:30 today. But he doesn't have to give an injury report until next Wednesday. He sometimes likes to hide injuries from the opponents like he did with Roddy's hamstring. Jake Matthews played 75% of the snaps on offense (50 of 67) and 27 % of the special teams snaps (9). They can if they keep improving and making plays. A lot of players had a great game last night on defense but that was against the bucs, I'm saying do you think they can win against teams above .500? 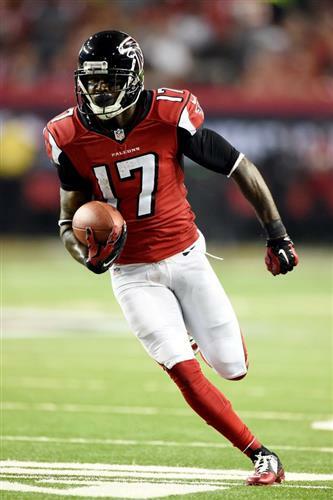 We'll talk to Coach Smith at 2:30 today and get an update on Harry Douglas and Roddy White, hopefully. (you're probably going to get this more than once) Any update on Harry Douglas? The defense is reconstruction project. They took some steps in the right direction last night. Corey Peters, Stansly Maponga and Jonathan Massaquoi must continue to improve. Peters had a strong game. Kemal Ishmael also made a play. I`m old and miss things, but when did Jackson become an outside the tackles runner like the Falcons have seemed hellbent on making him this year? But they can`t seem to find a way to get any of the three outside runners they do have on the roster in the game? Missing on a 7th rounder like Jackson isn't what is upsetting. Those are really just "preferred walk on" type picks anyway. It's the 1st, 2nd, and 3rd round misses that are piling up and ultimately costing this team a shot at a title. I'll definitely check out NFL.com. Thanks for the tip. Given how early it is and the new starters on defense, do you have a specific concern about this team that you don't expect to be resolved? That's what Mike Nolan said. That's why he wanted Lowery. He knew the defense and concepts, not necessarily the alignment. D Led -you're saythis 4-2-5 scheme we're running is the same as Rex Ryan's D? All of the plays work if executed. Dirk's a fine signal caller. Is it me or Dirk is not the most creative OC? I cna almost predict what plays the Falcons will run in eahc situation. And he let a Rookie OC out scheme him yesterday? He can walk when Mike Smith leaves. He's respectful to his players. No doubt, but the defense needs time to gel. You have a bunch of guys playing together for the first time. Soliai, Jackson, Massaquoi, Alford, Lowery and Bartu are new starters from defense that opened last season. The reality is that it's going to take some time. Bottom line is without a drastic improvement on the defense side of the ball the best you are looking at is probably 8-8, but my guess is 7-9. You're just probably old and remember when you just went to watch the football game. Yes, that's why I give the assignment. You can go the NFL.com, put in draft, falcons. Gives you the year by year list of players drafted. They've missed miserably on offensive and defensive linemen. Sidbury, Garrett Reynolds, Mike Johnson, Andrew Jackson et al. That would be a great idea for a column. Have you ever run anything like that? Maybe you should. Great idea. Led! (talking about your chart of his picks). Yeah, I can do without all of the "marketing" and entertainment experience junk. Just play some good football. Mentally weak, what is that? There was no sense of urgency when the offense was in that "psuedo" hurry up offense with about 7 minutes left in the game. Nobody was in a hurry. It was like they had given up. Us fans are not crazy or overreacting. Even Rich Gannon who was calling the game pointed it out. There team is seriously flawed. You can't play tough when your players are mentally weak. Also, you can't fool the fans. The Bengals are good. The Saints might not be that good. Browns defeated them on Sunday. Strange first two weeks of season.....are the Bengals that good an seems to make a difference sticking with ahead coach? See previous answer so you can hurled informed accusations at the GM. Well, if he hits on 30% of his middle round picks just since 2009 that's 9 players out of 30 picks that should be contributing significantly. Where are they from rounds 3-7? Willy is one of the picks to make to the Pro Bowl. He's more that average. Go back and count them. Rate them like this: Pro Bowlers, Starters, Reserves, On a NFL roster, Out of the league. Make a chart for over the past five years. See what that looks like. Just because TD doubles down on "hits" like Sam Baker and Willy Mo doesn't mean that he really "HIT" on those picks. Willy is average at best, and Sam is below average. I'd say he's missed far more than 70%. They announced him as OLB who can come off the edge. Then when Weatherspoon became injured, they viewed him differently. No, it's a unit under construction. They have six new guys and are trying to play a deep rotation along the line. It's going to bumpy early. I'm fine with giving them six games. If they can go 4-2 or 3-3 and be fierce down the stretch, they could have a shot at making the playoffs. Fair to hit the panic button on this defense if TB puts up big numbers on Thursday night? Lowery was a New York Jet and played for Rex Ryan. The Falcons use the same defense. WHy do the Falcons keep bringing in players from Jacksonville (ie Lowery, etc). It's not like the Jags have done anything in the last 10 years...this pipeline with Mike Smith needs to stop. I think they are the only ones who believe they can generate a pass rush. I haven't seen it yet...and haven't seen it for 2 years now. And there you have it with his draft misses. He hits on the high draft picks but misses on depth and its killing this team. How much influence is Pioli having during the season? I noticed he wasn't on hard knocks much if at all.